This manufacturer has been around for 31 years in the UK and are often used for customers that require a lift for a narrow staircase, as they have one of the slimmest units on the market. The company started in the early 1980’s in the North East where the founders brought together a small firm of engineers, sales and customer service specialists to create the Bison brand. The firm did very well, retailing bespoke stairlifts to NHS and Local Authority clients and people gaining grant funding through Disabled Facility Grants. The range began with a straight lift but over the years and after substantial investment the company expanded to offer curved models and also retailed through a network of dealerships that were established in 10 countries. 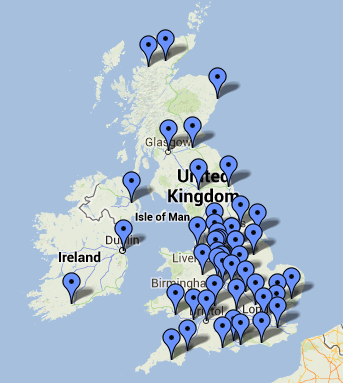 The address is below and for UK customers you can only purchase their range through their national dealership network. Castle Comfort is an approved dealer of these stairlifts in the UK. The range now covers both Straight and Curved models. For more information on the Bison models scroll down below. We can get you a quote from any number of different lift manufacturers of which Bison are just one. To see a wider range click here for our comparison chart. To ask further questions please call us or fill in the coupon for a brochure request or to get your free tip sheet which covers “Ten of the Commonest Mistakes When Buying a Stairlift.” Make sure that you or your family aren’t about to make one of those errors. Fill in the simple form today to get started. Bison is among the top UK stair lift companies that have continued to release reliable and dependable products to the market. Its products fit virtually any staircase and their range includes units that are designed to give you accessibility to your home whether your home has two, three or four floors and they also make an outdoor model as well. The Bison 50 is the newest release and is a upgraded version of the original Bison compact with a number of modern design features. One of its main advantages is that it is very slim, even when folded up. It measures about 12″ or 300mm at its narrowest. This feature makes it very appropriate in cases of steep or particularly narrow stairs. Better still it allows other people such as other family members or carers to easily use the stair cases when the lift is not in operation. Often an installation is required primarily for one person of a couple in the home. The lift is then sized and designed for them and their needs. Their partner who may be more fit and mobile and is thus able to climb up and down the stairs as they were previously, and they will be completely unhindered going past the unit which folds neatly away against the wall or newel post. Another advantage associated with the Bison 50 is that it has an in-built swivel seat whose height can be adjusted, with a range of seat spacers, prior to purchase, so as to more precisely suit your exact needs and comfort. Safety belts are also installed to ensure user’s safety and peace of mind, and again there are options here for either car-type lap seat belts or quick releasing aeroplane-type belts. It should be tightly placed so that it can effectively serve its purpose and be easy to fasten for even those with limited hand or arm mobility. 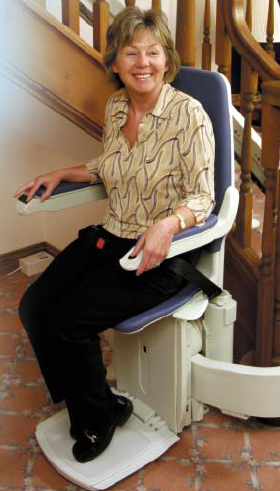 This stairlift also features safety edges which are very useful in sensing obstructions on the staircase. It’s these obstructions that may cause an accident, so a dropped soft toy from a grandchild for example will be sensed in time, and appropriate measures can be taken to keep the stair lift rider safe. The lift will stop and the rider will reverse to see what the obstruction was. It can then be removed with the aid of a walking stick or grab handle or put away by an able bodied person in the home. The low lip footrest of the Bison makes it easier for the user to stand on and then sit down on the seat and is also ideal for making the exit from the lift smooth and safe too on the landing upstairs. To make it more convenient even in times of power cuts the Bison 50 has a rechargeable battery pack. Power failure won’t be a problem as the 50 will automatically charge up the batteries when the lift is parked on its charging point. The cost to recharge the batteries is somewhere around the cost of a few pence a day. A little price to pay for peace of mind. It also has another convenience feature which is the auto parking button. This makes it very easy as it helps the user to fold up the footrest and swivel seat without having to bend. The user can easily operate it with its remote control. The Bison 50 has a self diagnostic display installed on the carriage which displays the status of the lift and whether it requires any service. All the additional features of Bison 50 straights are designed to increase the users comfort and promote their independence in the home. It also has a weight limit of 28 stones which as a feature makes it suitable for use as a heavy-duty or bariatric model. We will do the installation to your complete satisfaction. You can contact us to find out more. There are millions of people who have reached a point in their lives where climbing stairs has become difficult. They no longer are able to handle walking up the stairs to reach the rooms on the second or third floors. These rooms will go unused at times, while the living rooms or dining rooms downstairs become bedrooms on the ground floor. People do what they must to live comfortably, but it doesn’t have to be like that. Whatever shape your staircase is there is a good chance that the Bison 80 can be installed in your home and as previously mentioned is ideally suited to narrow and curved staircases. Now with the help of the Bison 80 it is possible to once again live on all floors of your home. People who couldn’t make it to their bedrooms are now able to manage the stairs without danger of falling. They can sleep in their upstairs bedrooms or use their main bath on the second floor instead of washing with a flannel at the kitchen sink or the downstairs toilet. The testimonials people make when they finally take action are really satisfying to see. People are able to use all rooms in their homes because of these inventions and the relief is amazing. Get your stairs looked at and get a free no obligation quote or two by contacting us now. 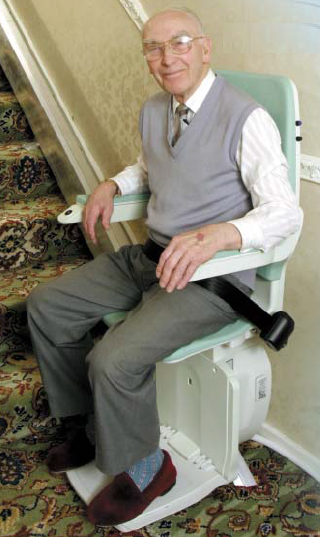 The stairlift can even manage to go around corners and on steep inclines without the risk of tipping or tilting. Anyone riding in the comfortable seat of the Bison 80 will have no worries of falling off especially when wearing their seat belt or taking advantage of the optional interlocking barrier arm. The lift will follow a railing that is installed to the staircase itself. The chair, which is designed with comfort in mind, follows the rail all the way to the upstairs landing. There the person in the chair can get off and be where they want. Most units have a low step or no step at all to exit from the chair, and this this a main built-in feature of the Bison 80 curved too. This lessens the chance of a fall that could break bones. Your installation is only done by professionals who know exactly how important safety is to anyone using the lift. They will make certain your model is safe for everyone to use regardless of the size of the person using it. They will install the rails and connect the chair without mess, fuss or any debris. The chair of the lift will have a swivel seat so getting on and off is easy. The installation team will make sure everything is demonstrated to you before they leave your property and ensure that you are happy with everything before they go. They will also present you with your own Bison lifts manual so others can understand how everything works and who to contact in case you have any questions. The price of a curved chair lift will vary due to taking into account what is needed by the person purchasing it. Some staircases might need a space saver seat or an extra wide seat. Other options are powered swivels or run on tracks onto the landing. Whatever your choice of options be assured that a call to us will help you navigate through the different brands available and which is the best company for your unique staircase and individual needs. To ensure the price of a Bison 80 is the best possible it is wise to use the services of a company, like us, that understand what installing a stair lift is like for their own relatives. Castle Comfort started out by doing just that and the overall aim from shopping to installation to using it, is simplicity for the customer as top priority. Closely followed by reliability and value for money. There will be a lot more ease and comfort for the customer once the lift is installed. Why not get started right now? CALL 0800 007 5050 TODAY!